If you’ve never rafted Gore Canyon it’s unlike any other river trip in Colorado. Gore is no float trip and should be run by experienced boaters if you are not going through a guide service. This adrenaline packed stretch of whitewater offers continuous class IV and V rapids. There are many outstanding guide services offered to run Gore Canyon, and it is well worth the money. The raft outfitters that run Gore use their top guides who know the canyon well and have the most experience on the water. Gore is not for the faint of heart. It is recommended that anyone rafting this stretch be in good physical condition. Many companies that run Gore commercially have requirements that participants must meet in order to take the trip. As a guideline for fitness, it is recommended that you are able to run a mile and able to swim ten laps, as many companies suggest. You will most likely be required to swim a class III rapid that is encountered before entering into the IV’s and V’s. You will also have to practice pulling yourself back into the raft if you happen to find yourself on the “swim team,” and participate in a raft flip-drill so you will know what to do if the raft turns over, which is a strong possibility on a Gore trip. Depending on water levels, Gore usually runs from mid August through the beginning of September which makes it perfect for those who were not able to raft mid summer. 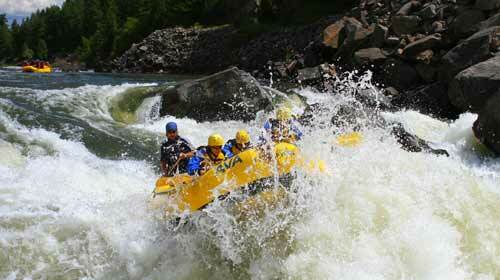 It is not recommended that Gore Canyon be your first ever rafting experience, because of the intensity of the stretch. If you have been rafting before and are comfortable paddling through class III-V then Gore is probably the best trip Colorado has to offer. The Colorado River drops about 120 feet a mile through Gore Canyon and it is a very remote area. The isolation of the area must be taken into consideration, especially if you are running it privately, as recues and road access may be difficult to attain. As of Thursday, August 4 the Colorado River was running at 1000 cubic feet per second (cfs), according to the USGS website. 1000 cfs is a great level for Gore. To check river flows throughout the state visit http://waterdata.usgs.gov/co/nwis/rt.